Think you know everything about styling your hair? I did too before I wrote this post. Some of these hair hacks are just borderline genius. Some even made me want to face palm. How could I -- a beauty blogger -- be doing it wrong for that long? So if you're reading this and didn't know some of these, you are in good company. Looking for makeup life hacks? I've got those too! How do you put a bobby pin in? Wavy side up? Me too. But that's wrong! The wavy side goes down to grab the hair. Who knew? Do your bobby pins slide out of your hair? Spray them with dry shampoo spray or hairspray before you put them in. They will grab your hair and keep it in place. Hair still slipping out? Try spin pins. They are great for buns and hard to hold styles. Can't find a hair clip in the color you need? Use nail polish to paint your bobby pins! If your hair brush gets dirty, it will drag dirt and oil through your clean hair. Clean your brush as needed by removing all the hair -- use a pick to get it all out -- and clean with shampoo and water. Let dry. Wish you had longer hair? Fake the look with a pony tail. Instead of gathering all of your hair in one pony, divide your hair in half from ear to ear. Put each section in to its own pony tail. Use a curling iron to put waves in the loose hair from the top pony tail to hide the bottom one. Want your style to last longer? Blast your hair with cool air after you style it. This sets the style so it lasts all day. Braid your hair first and then run your flat iron over the braids for wavy hair. Smaller braids give you tighter curls. If your hair is pulled back and you have flyaways, spraying your hair directly can give you helmet hair. Instead, spray your hands and smooth your hair down. If your hair tends to get frizzy, don't rub it with a towel when it's wet. Just press the towel against your hair to blot out excess water. If your hair gets really tangled at night, mix 1 part conditioner and 3 parts water and spray on your hair as a detangler. It help the comb slip right through your hair and won't weigh it down. If you always wake up with tangles, switch to a satin pillowcase. I did this for my daughter's baby fine hair, and mornings are much easier now! Don't have time to wash your hair? Just wash your bangs. That's usually the greasiest part, so it will remove grease and no one will any the wiser. Too tired to shower at night? Spray some dry shampoo in your hair. It will absorb excess oil overnight. You can also make your own dry shampoo. Want curls for the day but don't want to use heat? Try rag rolling your hair. This is great for kids because it won't damage her hair. Roots showing your natural color? Hide them for the day with eyeshadow. Just brush a shade on that's close to your natural hair color. Can't find a ponytail holder to match your outfit? Use any color and wrap a small section of hair around the band. Pin with bobby pin. 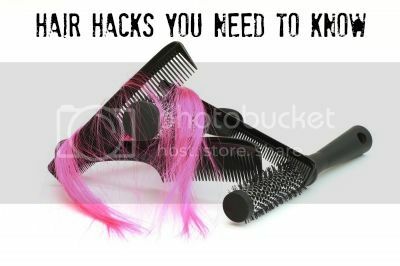 Do you have any hair hacks to share? Leave them in the comments!